OSU Sports Hall of Fame inducts former basketball player Loy Petersen, of Madras, in 1993. The Madras Union High School started Monday morning with its corps of teachers complete. 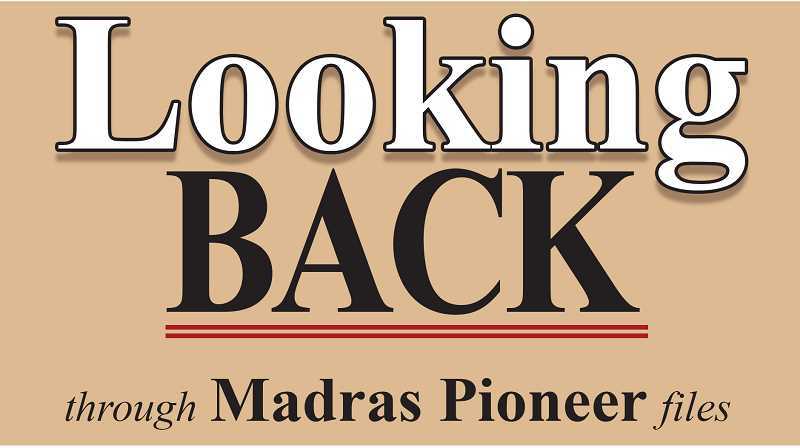 Considering the fact that the war has made serious inroads on the teaching profession, Madras is fortunate to start fully equipped in its teaching force. The newly elected principal, John E. Love, is a graduate of Maryville College, Tennessee, and has had 14 years' experience in teaching, two of which have been in normal school work. He was connected with the old Central Oregon Normal, formerly located in Drain, and his particular fitness for this class of work is of special advantage, since the high school is instituting the teachers' training course this year. Mr. Love will teach mathematics and teachers' training. A Powell Butte man met instant death early last Saturday morning when his head was crushed between the framework of his truck and the dump body as he was working on repairs on the truck. The truck was at Runge's garage when the accident occurred. Evidently making repairs on the hoist, the man had raised the dump body, and, according to reports, had let the oil out of the hoist, allowing the body to come down on his head. He had been employed on the project here previously, and according to reports, had only come back to work the day before the accident occurred. More than 50 Madras area students, most of them full time, have enrolled at Central Oregon Community College in Bend for fall quarter. That figure does not include adults in continuing education enrollment from the Madras area, according to figures compiled in the office of the registrar. General registration figures at COCC indicate enrollment is running about 100 full-time students ahead of last year. As of Monday afternoon more than 700 students had registered and paid fees. Loy Petersen, a member of the Beavers` 1965-66 basketball team, will be inducted into the Oregon State Uiversity Sports Hall of Fame during a ceremony scheduled for Oct. 22, at the Corvallis Country Club. Petersen, now a farmer in Jefferson County, and his teammates will join Steve Brown, Scott Eaton, Steve Johnson, Mary Ayotte-Law, Rocky Ralsey, Clayton Shaw, Greg Strobel, Skip Vanderbundt, Tim Vollmer, Berny Wagner, Roger Weigel, Robert Zagunis and the 1939 football team as the 1993 class of inductees. "It came out of the clear, blue sky," said Petersen. "You don't realize you're a part of history until someone tells you." During the historic 1965-66 season, Petersen led the Beavers in scoring with a 12.8 point average and was named to the Sports Network All-Star team as a sophomore. All in a day's work for a young athlete at a major university. "You're so young at the time, you just know you have a job to do," said Petersen. "You look back on it now and feel a sense of pride." Picked to finish in the middle of the pack, Oregon State's memorable climb to the top of West Coast college basketball was a shock to those following the Pac-8. But not so much to the players. "It was a group of overachievers," said Petersen. "Our coach was a very motivating force and didn't give us many options. We had a solid work ethic and there was no choice in the matter." Under Coach Paul Valenti, the 1966 OSU Cagers won their first and only Pacific-8 Conference title. The team was 12-2 in league play (21-7 overall) and had the distinct honor of stealing the Pac-8 crown from UCLA, something no other school was able to accomplish. "We got beat by UCLA the first time we played them and then we came back to beat them the second time, which had to be a highlight of the season," said Petersen. After losing to the Bruins in their conference opener, Oregon State went on to win 12 of their next 13 games, including a 13-point drubbing of UCLA and a season ending sweep of Oregon. The Beavers advanced to the NCAA playoffs, where they defeated the Elvin Hayes led Houston Cougars 63-60 and then lost to Utah. When OSU went up against the Cougars, it was a basketball aficionados dream come true, pitting the nation's top offense against the best defense. "They were scoring over 100 points per game and we beat them," said Petersen. "It was a real thrill." Oregon State also won the Far West Classic in Portland during the same campaign, downing Air Force, Arizona State and Stanford along the way. The defense-minded Beavers finished the season as the NCAA's stingiest team, allowing just 54.4 points per contest and holding 10 opponents below the half-century mark. After completing his college education at OSU, Petersen went on to play for the Chicago Bulls of the National Basketball Association. He eventually moved to Madras, where he now resides with his wife, Carol, and two children, Eric (a member of the OSU basketball team) and Mandy. Although the experience of winning a Pac-8 title has long past, Petersen still has fond memories of his days at OSU and the lessons he learned have carried over into adult and family life. "Athletics promote self-discipline and we still need that today," he said. "It was an important part of my life." Jim Jarvis of Bend was an assistant coach for the 1966 Beavers, along with Jim Anderson and Bill Harper.